With glistening bodies, thrusting jabs into space above and ahead, with undulations and precise isolations of body parts, their young bodies inscribe a knowing and a meaning that only them and their peers can grasp. As an audience member, perhaps you will observe recurrences of facial micro-expressions on the dancers; expressions of peacefulness and other-worldliness. The movement analyst might reach into her bag of tools to note effort qualities: pulses of bound, direct gestures; quick shifts and sustained undulation. Perhaps Brenda Dixon-Gottschild’s Africanist aesthetic senses (1996) may come to mind. The deep base and vibrates the sound system and the space, and the hop-hop vocals are reminiscent of percussion arrangements. Krumping pulls you in, it seduces and it challenges. The body is at once a weapon, a promise of liberation, and a memory of many bodies–black bodies–that have come before. Reading Julie Malnig’s Ballroom, Boogie, Shimmy-Sham, Shake, what becomes evident is the cultural significance of social dance forms in both formation and assertion of cultural identities in the history of the United States. This is in line with Cynthia Novack’s theory of movement and culture that suggests that movement systems embody cultural meaning, and relay cultural realities. Movement is thus deeply linked to individual identity and to interactions with one’s cultural environment. Also evident in Malnig’s text is the persistence of what Cuban anthropologist-philologist, Fernando Ortiz neologized as transculturation. Dance historian, Juliet McMains, describes this as, “ the emerging of elements from [distinct] cultures to create a new phenomenon.” (Malnig, 308)[i] In teh many essays of Malnig’s anthology, the presence and influence of black and non-white bodies is evident. The emergence of many now-commercialized forms from social, non-white space is also evident. From Tango, to Salsa, from breaking to ballroom, and so on. My central concern for this piece, however is with another aspect that comes through in Malnig’s anthology: how popular forms begin as marginal and vernacular, and end up as a commodity in the mainstream market of “how-to” products, and as promotional fodder “siphoned off” to sustain the popularity of music artists. I am interested in recurrent “whitening” of vernacular form in order to facilitate (predominantly) Euro-American cultural escapism to the disadvantage of their originary communities. Similarly, in the context of Euro-western modernity (which is only one of many modernities), the “black body” (Young, Mohanran) stands in opposition to black flesh (Musser). The black body, as representative of African humanity, is turned to black flesh by processes of said modernity. Black “flesh”, as seen by Amber Musser, is that which has had its humanity torn away, and has been violently rendered into the raw material upon which a Western modernity has been build. (2014) This has, and continues to occur through a process she calls “enfleshment”. Though Amber Musser’s work refers more directly to biopolitical matters, I use it metaphorically to investigate the cannibalization of Africana cultural practices for the benefit of a global capitalist economy. I focus on the urban dance form of Krumping to illustrate how the communal aspects of vernacular forms are lose ground to a ‘teleology of stardom’, and the transformation (an translation) of social dance forms into studio and theatrical space. It is also important to note the function of complicity in this affair. This is a rather common debate to be frank: what is lost and what is gained (and by whom) when a dance form enters the mainstream. But my interest rest with the location of the black/African body in this debate. And what happens to black embodied knowledges as they transfer from one body to another. It is the erasure and corrupting of this hidden transcript that I am concerned with. Does this sacred quality translate to the studio space, the theatrical stage or the glossy music video? This idea is reinforced watching the 2005 documentary Rize that was filmed by the fashion photographer and music video director, David LaChapelle who refers to the krumpers as “the children of Rodney King.” (Trebay, 2005) Rodney King stands in for the brutalized black body; the body that is part of a long history of violent supression by totalizing politico-economic reality; what some, including Musser and Christina Sharpe might call an anti-black modernity. We see the dancers enter ecstatic and trance-like states reminiscent of evangelical Christian services or African trance rituals. LaChapelle even edits in footage from wrestling gatherings of the African Nuba people of Kau for a scene in which a female krumper looses consciousness or ‘gets struck’ while Krumping. [iii] Is this juxtaposition an oversimplification that may overshadow the originality and relevance of Krump and a uniquely American form? Or is it a useful recognition of the migration of embodied knowledges of that has accompanied members of the African diaspora unbeknownst to their oppressors? Krumping’s originary sociopolitical context is when South Central Los Angeles – particularly ‘hoods’ like Watts and Compton – “[start] to resemble the police state atmosphere of the 1990s” after the Rodney King riots. (Malnig, 342) Zanfagna relates how in 2002, the ex-police commissioner of New York city becomes chief of the L.A.P.D and employs similar tactics he had used to ‘clean up’ L.A. Law enforcement targets petty crime (graffiti, loud stereos, disorderly conduct etc) resulting – advertently or inadvertently – in the criminalization of black youth through a localized ‘state of exception’. As I watch Rize and listen to the testimonies of krumpers, I too hear the echo of the cipher described by Franz Fanon. The French-Algerian, revolutionary, psychiatrist and philosopher describes the circle as a communities attempt to “exorcise itself, to liberate itself, to explain itself.” (1963: 57) It is the B-boy’s battling cipher, the non-gang affiliated space of Jookin’, the emotive storytelling of Turfin’ and the “active communal force” of Underground House. Agamben, Giorgio. State of exception. Chicago: University of Chicago Press, 2005. Print. Banes, Sally. Writing Dancing: In the Age of Postmodernism. Wesleyan University Press, 1994. Gottschild, Brenda Dixon. Digging the Africanist presence in American performance: dance and other contexts. Westport, Conn.: Greenwood Press, 1996. Print. LaChapelle, D. “Rize. [Documentary].” Los Angeles, CA: David La-Chapelle Studios (2005). Malnig, Julie. Ballroom, Boogie, Shimmy Sham, Shake: A Social and Popular Dance Reader. Urbana: University of Illinois Press, 2009. Print. Musser, Amber J. Sensational Flesh: Race, Power, and Masochism. New York: NYU Press, 2014. Internet resource. Novack, Cynthia. 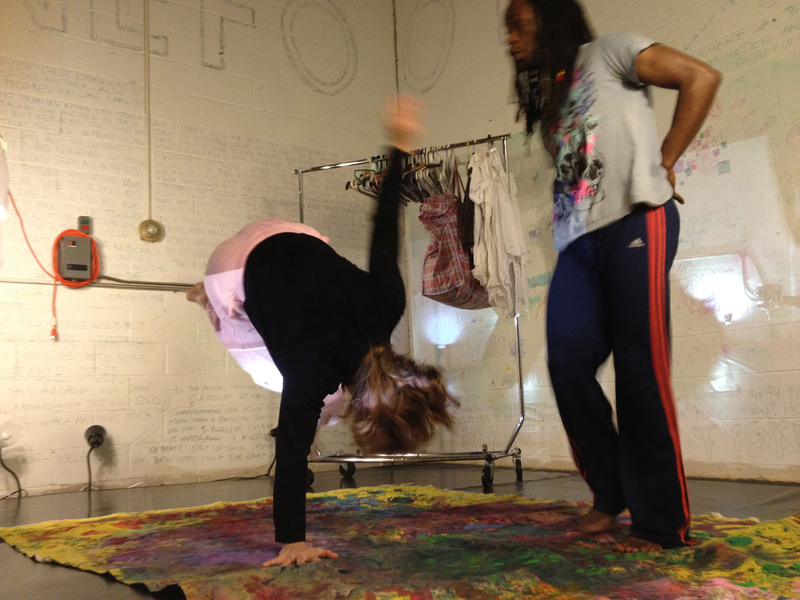 “Looking at Movement as Culture: Contact Improvisation to Disco,” Theater Drama Review 32, no. 4 (1988): 102-19. Ortiz, Fernando. Cuban counterpoint: Tobacco and sugar. Duke University Press, 1995. Trebay, Guy “The Clowning, Wilding-Out Battle Dancers of South Central L.A.” New York Times 19 Jun 2005: http://www.nytimes.com/ 30 May 30 2013. Trebay, Guy “Hip-Hop’s New Steps – Jerking” New York Times 20 Nov 2009: http://www.nytimes.com/ 30 May 30 2013. Young, Harvey. Embodying Black Experience: Stillness, Critical Memory, and the Black Body. Ann Arbor: University of Michigan Press, 2010. Internet resource. [ii] Turner, Victor Witter. From ritual to theatre: The human seriousness of play. New York: Performing Arts Journal Publications, 1982.